This is Chester at the keyboard. My master Che-Cheh is out. No idea where she’s at right now. What I know is she said she’s cooking something tonight for Christmas Eve. Just for the fun of it. I’ll be waiting at the kitchen door as usual. Hoping to get few free bites. Oh before I forget, Merry Christmas & Season’s Greetings to all my *cough cough* lovers. Ciao! The Treasure Hunting Golden Retriever! 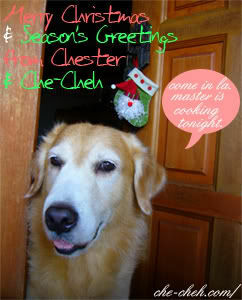 Merry Christmas to Chester & Che-cheh mui mui! Merry Christmas, Chester!! Please tell Che-cheh that Narrowband wishes her and her family Merry Christmas too! Remember ya? Hedo, Merry Christmas to you too. MonkeyWong, no Turkey. Merry Christmas. Jason, Merry Christmas to you. Have a jolly day! Narrowband, yes I remember. Thank you! Criz Lai, thank you. Merry Christmas to you too. 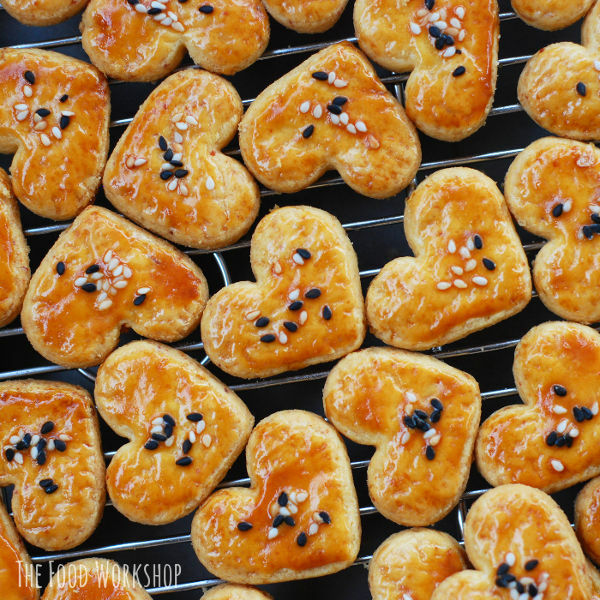 Neo, I received 3 cookies bone from Che-Cheh. Merry Christmas to you too. Awww… Chester looks co cute in this picture. Hope you have a great X’mas celebration. Merry Xmas and Happy Holiday!